It has been an interesting week here in Cauldronland. The trial of Benito Acosta seems to have sucked most of the available energy from readers of the Daily Pilot and the bloggers who post their views online. There apparently is no spleen left unvented. Well over 150 - and counting - comments have been posted on the several articles on this subject, which can be read here, here and here. As I type this, the most recent article this morning, here, announces that the appeal of the decision by Judge Kelly MacEachern to dismiss the case late last week has been denied. So, this part of the Benito Acosta adventure is over. On the horizon, apparently set for a spring start, is the federal civil rights case filed by the ACLU on behalf of Acosta against the city. That one has the potential, should it be resolved in Acosta's favor, to reach into our city coffers and extract very significant dollars. And, as painful as the financial part of it would be, even more destructive will be the cost to the city's reputation, which is rapidly becoming one of a bastion for intolerance. Of interest is the fact that the word "recall" has been bandied about on the blog, postulating that the way Mayor Allan Mansoor handled the events of the City Council meeting on January 3, 2006 is worthy of being recalled from office. Even though he clearly demonstrated bias - some would say prejudice - in the way he handled Acosta versus the way he permitted his sponsor, Minuteman Project founder Jim Gilchrist to permit his "5 or 6 dozen" supporters to stand when he spoke to show their support of his views, I don't think that mistake is sufficient cause to try to recall our young jailer/mayor. Mounting a recall effort is costly, both in terms of dollars and community harmony. The mayor and his running mate, Wendy Leece, gained sufficient votes last year to make me believe that a recall effort would fail. There may be no bigger critic of the mayor and his majority in this city than this writer. 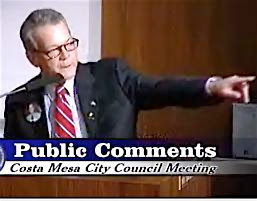 I think his actions, supported by his majority, have caused Costa Mesa to become known as a city without a heart. I think their attempt to create their own foreign policy by advocating the designation of every Costa Mesa police officer as an immigration screener destroyed the bridges built over the previous two decades between city government and the Latino community - one third of the population of our town. Under the guise of making Costa Mesa "a safer place", they have created an atmosphere of fear and apprehension on the Westside of our city. I, for one, don't feel much safer knowing that the bible teacher who was snatched up for riding his bicycle the wrong way has been deported. Nope, that doesn't make me sleep any better. Each month, when the Costa Mesa Police Department presents their crime figures - which now include statistics for those arrestees who have been screened by the agent of Immigration and Customs Enforcement (ICE) presently assigned to our jail - anti-immigrant activists crow about how much safer our streets have become. I have seen no statistics that tell us how many of those detained by ICE are actually convicted of a crime and subsequently deported. Along with that information, I'd also like to know how many previously deported criminals have been re-arrested, having returned to our city following deportation. In my view, until and unless the federal government secures the border, anything done by ICE in Costa Mesa is only window dressing. Yes, I certainly do want dangerous felons - that's how the mayor described his target group when he first proposed having all the CMPD officers designated as immigration screeners - off the streets and kept off. This present program doesn't seem to be doing that. Rather than waste fiscal resources and emotional energy on a doomed recall effort, I suggest those in our community who have had enough of the mayor's heavy-handed style of governance begin right now to find candidates to change the power structure on the council. In just over 12 months we will elect three council members - a majority - so the opportunity is there for a change for the better. However, the only probable candidates in addition to Katrina Foley that I see poised for a run are sycophants of the mayor and his current majority. Assuming our resident court jester, Eric Bever, chooses to run again, it's likely he will be joined by one or more self-described "improvers" in the race for the three seats to be contested. 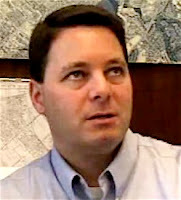 I've even heard rumors that turncoat Gary Monahan, the termed-out twelve year, pension-eligible former councilman and mayor might run again - apparently hoping to add years to his pension pot. You may recall that it was Monahan who, inexplicable, changed direction and joined Mansoor and Bever to form the first majority that began directing this city onto it's current path of intolerance. For that move he found immigrant's rights activists camped on the doorstep of his business for several weeks, chanting epithets at him and disturbing his customers. With that as a backdrop, it's unlikely he would view the plight of the Latino community with much sympathy should he regain a seat on the council. Unless new candidates surface who represent a more balanced approach to the governance of our city, we will be doomed to be under the thumb of this narrow-minded group of anti-immigrant activists for the next decade. Unless we are able to shift the power from those who seem destined to encumber this city with legal and fiscal penalties for their missteps, we will continue to see our precious resources used not to hire more police officers and fire fighters, nor to repair our crumbling streets, but to pay settlements and fines for their sledgehammer approach to governance. Now it the time to begin returning this city to the right path - the one that will take it back from the dark forces of intolerance. This word just in... sources at the courthouse just told me that the case against Benito Acosta - described variously as a "student activist" by his supporters or "pretend Indian" by his opponents - was dismissed late this afternoon by Judge Kelly MacEachern. Apparently, as reported earlier by Daily Pilot reporter Alicia Robinson, Costa Mesa's prosecutor Dan Peelman was not sworn in as a public prosecutor, which is a requirement of the state constitution. This procedural gaffe, which had been reported as being described by Peelman to the judge as a "harmless error", toppled this case after more than a year of preparation and nearly a week of testimony. It's my understanding that there was an appeal filed this morning, which may or may not affect the judge's decision. According to sources at the court house, few knowledgeable observers think will change anything. When you consider the legal fees racked up for at least 5 pre-trial hearings , witness depositions and other billable items, one thing is obvious - the city sure didn't get bang for it's legal buck in this instance. There are those who think this never should have been brought to trial in the first place, including the Orange County District Attorney's office, which reviewed the circumstances and chose not to prosecute the case. That should have been an alarm bell for officials in our city. Instead, this looks more and more to be about the petulance of the Allan Mansoor-led City Council majority, trying to teach Acosta a lesson for his rudeness before them on several occasions. Looming on the horizon is the federal civil rights case that will apparently be filed against the city by Acosta's ACLU attorneys. This one has the potential to reach deep into the city coffers and really do some financial damage - all because we have a majority that lacks the maturity and wisdom to effectively manage this city. So, dear Costa Mesa readers, the next time you fall into a pothole or have to wait longer than you wish for response by a member of Costa Mesa's public safety organizations, thank the majority on the council. They've developed "frittering away money" into an art form! At noon today Alicia Robinson reported on the Daily Pilot online that Costa Mesa's case against Benito Acosta might be in jeopardy. You can read her story here. Having read the piece, I cannot imagine that the court will go along with the defense position that the case should be dismissed. However, strange things happen in court rooms. I did not attend any of the court sessions of the trial of Benito Acosta last week, but the information from news accounts and anecdotal reports from some who were there indicate there was some pretty interesting testimony provided - including some from our young jailer/mayor. Reporter Alicia Robinson provided an excellent capsulization in her article in the Daily Pilot today, here. She projects that the trial may continue through the middle of next week. A very interesting sidebar is the mayor's reaction to earlier news coverage provided by the Daily Pilot, here. In fact, once at that link you will be able to scroll down to Mansoor's seven segment, nearly 500 word, rebuttal to the text in the article. Even more interesting is the fact that the mayor's version of events contradicts the actual video record, which is available for all to view by going to the city web site. Use this link, then select the record for January 3, 2006. 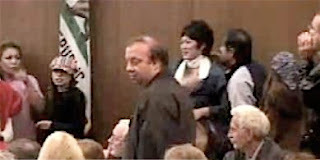 In question is exactly what happened when Jim Gilchrist, Mansoor's sponsor as an honorary member in the Minuteman Project, stood to speak. Gilchrist's segment begins at 00:07:13 on the streaming video counter and runs for more than his allotted 3 minutes. Fifteen seconds into his talk he points to his "5 or 6 dozen supporters" in the audience and asks them to stand to show their support. Although the mayor says he admonished them, this video record shows that he didn't. In fact, if you view the video you will see that he actually encouraged them to stand showing support for Gilchrist's view in lieu of speaking, too. More important, he encouraged "the other side" to do the same. Certainly, Benito Acosta's supporters would qualify as "the other side". The mayor has selective memory, which is very strange, since anyone can view the video and see the truth. Although it is possible, I cannot believe that he didn't view the record before testifying. So, once again, we have a fabrication instead of the truth. This whole thing about Acosta is a very big deal - especially for Acosta. He might be fined and/or jailed as a result of that evening's events. Of much greater concern for me is how it demonstrates the cavalier disregard for the truth on the part of the mayor. It's as though he thinks no one will bother to check the record. In fact, in his Daily Pilot blog tirade, he specifically indicates that's what we should do. He states, "We are at a point where people need to provide their own oversight and research to get the facts on issues." Well, when we do our own research we find that he has not been truthful. How are we to interpret his divergence from the facts in this matter? 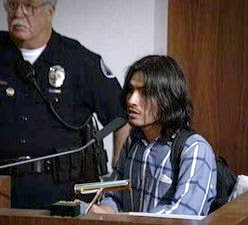 Is it possible that our young jailer/mayor perjured himself on the stand last week? I cannot imagine him doing that intentionally, but whether didn't tell the truth on purpose or due to ignorance, the effect is the same. Is it really possible for him to testify untruthfully on an issue so easy to verify? If so, one would think this could be big trouble for a sworn law enforcement officer. 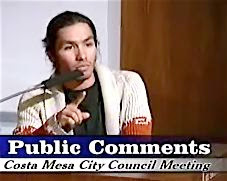 For a different, longer, view of Acosta's removal from the city council ch ambers the night of January 3, 2006, go to this link, which is a video posted on YouTube. This five minute clip not only shows Acosta being removed from the auditorium, but the subsequent demonstrations, as well. Near the end, those familiar with city politics will recognize among the demonstrators some staunch Mansoor supporters, trying to "sing down" the Acosta supporters. It certainly seems to me that there was fault on both sides that evening, regardless what precipitated it. Also of concern to me is the fact that, regardless the outcome of this criminal trial, Acosta apparently has filed a civil suit against the city. This reeks strongly of yet another pile of money to be lost by the boneheaded moves of our city council. I'm concerned that we will end up either settling that case out of court or losing a sizable judgment - money that could have been used for more public safety staff members and repairing our crumbling streets. So, as the week progresses, we will look for more information on this trial and contemplate how the outcome will affect the lives of Costa Mesans and the future of some of it's politicians.